Inflammation refers to the initial physiological response to tissue damage, such as that caused by mechanical, thermal, electrical, irradiation, chemical, or infection. It can be acute (lasting for a few days) or chronic (in response to an ongoing and unresolved insult). Inflammation can develop into permanent tissue damage or fibrosis. In this article, we shall look at the processes involved in acute inflammation. Acute inflammation can be discussed in terms of two stages; (1) the vascular phase, which is followed by; (2) the cellular phase. In the vascular phase, small blood vessels adjacent to the injury dilate (vasodilatation) and blood flow to the area increases. The endothelial cells initially swell, then contract to increase the space between them, thereby increasing the permeability of the vascular barrier. This process is regulated by chemical mediators (see Appendix). Exudation of fluid leads to a net loss of fluid from the vascular space into the interstitial space, resulting in oedema (tumour). The formation of increased tissue fluid acts as a medium for which inflammatory proteins (such as complement and immunoglobulins) can migrate through. It may also help to remove pathogens and cell debris in the area through lymphatic drainage. 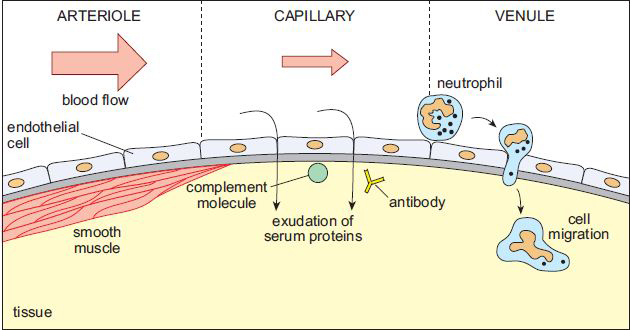 The predominant cell of acute inflammation is the neutrophil. They are attracted to the site of injury by the presence of chemotaxins, the mediators released into the blood immediately after the insult. Once in the region, neutrophils recognise the foreign body and begin phagocytosis, the process whereby the pathogen is engulfed and contained with a phagosome. The phagosome is then destroyed via oxygen-independent mechanisms (e.g. lysozymes), or oxygen-dependent mechanisms (e.g. free radical formation). An abscess is a localised collection of pus surrounded by granulation tissue. Pus contains necrotic tissue with suspended dead and viable neutrophils and dead pathogens. It forms when the primary insult is a pyogenic bacterium and extensive tissue necrosis occurs. 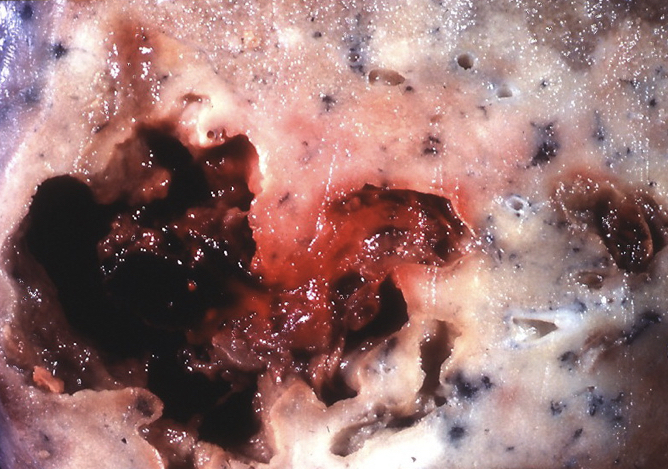 The initial inflammatory exudate forces the tissue apart, leaving a centre of necrotic tissue with the neutrophils and pathogens. Over time, the acute inflammation will cease and, if not surgically drained, the abscess will be replaced by scar tissue. An abscess can be a source for systemic dissemination of a pathogen, with the abscess acting as a harbour for the infection. It can also cause continually rising pressures within the tissue, resulting in pain and damage to local structures.